For the last thirty years, The Koren Siddur has been the siddur of Israel. Now, for the first time since its initial publication, the all-Hebrew Koren Siddur has been renewed to improve its classic style. 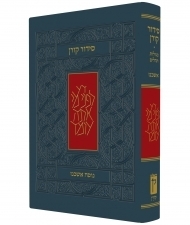 Newly added tefillot and features include: tefillot and kriyat HaTorah for hagim, Ma'ariv for Motza'ei Shabbat, the five Megillot, Tehillim, an extensive Halakhic guide, introductions to and explanations of the origins of key prayers, kamatz katan, sh'va na, patah ganuv, and meteg symbols throughout, and the prayer for missing soldiers. The siddur has a new, state-of-the-art binding and is printed on durable Bible paper.